100% organically farmed Roditis. The manually harvested grapes are destemmed and pneumatically pressed. The must is gravity-fed into small, temperature-controlled stainless steel tanks for fermentation (with indigenous yeasts) and maturation. Reducing sugar: 1.9 g/l. 12% ABV. The 2017 is currently available at the SAQ ($15.95, 12484575). Quebec reportedly buys around 80% of the bottles produced. Bottled two weeks before we tasted it in early July 2016. Panagiotis said it “will become expressive aromatically in two more weeks.” True to itself though rounder, richer and deeper than the 2014. My note from a bottle opened six months later reads: Expressive nose of candied white berries, quartz dust and a hint of jalapeño. The fruity extract and lemon overtones notwithstanding, minerally – even rainwatery – on the palate, an impression only heightened by the brisk acidity. Ripe-sweet upfront, dry on the long, saline finish. Direct and to the point. Experience shows this really comes into its own with a selection of meze or a grilled porgy. 100% organically farmed Malagousia. The grape originated on the other (north) side of the gulf. 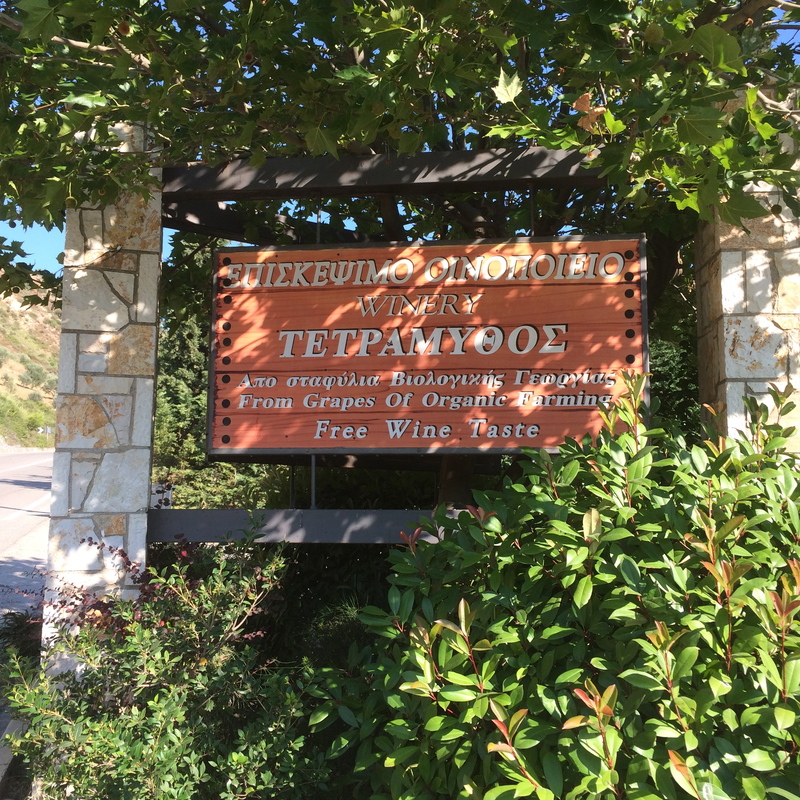 According to the winemaker, Tetramythos’s version has higher than typical acidity and less floral character than usual due to the vineyard’s high elevation. He also said the grapes produce “the greenest juice I’ve ever seen.” Macerated on the skins 30 hours, giving it a hint of tannins. Only the free-run juice is used. Fermented in temperature-controlled (18°C) stainless steel tanks with indigenous yeasts for 100 days. Underwent full malolactic fermentation. Reducing sugar: 1.8 g/l. 12.5% ABV. The 2017 is currently available at the SAQ ($19.00, 12910335). Pale green with paler straw green glints. Savoury, complex nose: herbal and minerally (“fried stuffed zucchini flowers” per Theo). Fresh and lively in the mouth. Seems a little fruit-sweet on the attack but is actually very dry. So minerally — crystalline even. Crisp acidity. Long, pure and delicious. 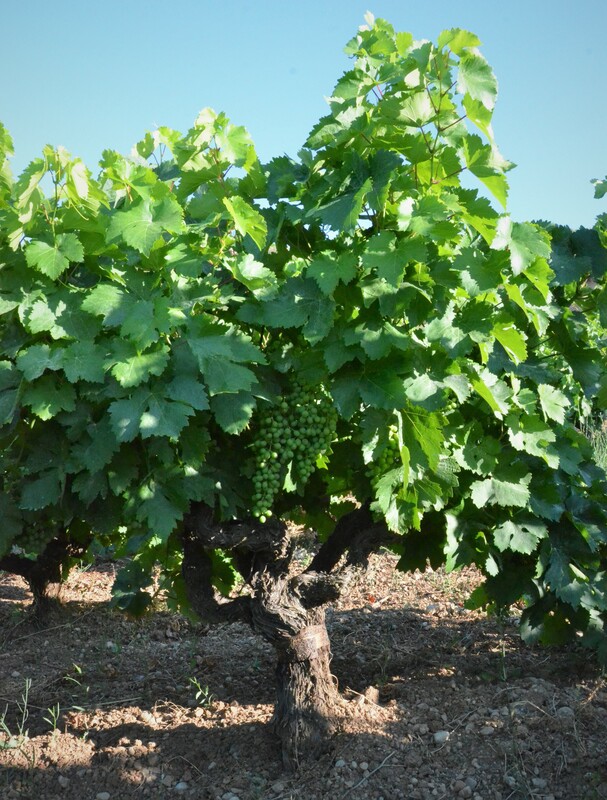 The aromatics of Malagousia can sometimes be over the top but that’s far from the case here. 100% organically farmed Roditis. Fermented in amphora with wild yeasts. Pine resin is added at the start of alcoholic fermentation (1 kg resin per 1 kl of must). Matured in stainless steel tanks. 12% ABV. The first Quebec shipment of this wine, in the 2017 vintage, is slated for release at the SAQ later this year. Put me down for a case! Pale straw yellow. Piney but not too, the resin analogous to oak on other wines and not overwhelming the minerals and yellow fruit. In the mouth, it’s dry, smooth, elegant even, and far from devoid of fruit. Not just unfatiguing but positively refreshing, due in no small part to the nippy acidity. Long minerally finish. Works superbly with garlic (tzatziki, anyone?). 100% Muscat Mikrorago (aka Moschato Samou aka Muscat blanc à petit grains) from organically farmed vineyards at 825 metres in altitude. Fermented with indigenous yeasts. Unfiltered and unfined. Sulphur dioxide is used only at bottling and then only minimally. 13.5% ABV. The 2018 is slated to arrive at the SAQ later this year. Subtle, faintly Muscat nose: limestone, spice, white and yellow fruit segueing to lemon and orange overtoned with honey and rose. A light-bodied mouthful of gossamer fruit, fleet acidity and great minerality. Long and so dry. Gorgeous. This was initially exported only to France (nowadays a few cases find their way to London and Brussels) and that it sells well there comes as no surprise, as it’s easily the equal of some of the beautiful dry Muscats from the Midi. 100% Sauvignon Blanc from high-altitude, organically farmed vines. Vinified in stainless steel. Underwent malolactic fermentation and maturation in oak barrels. 13.5% ABV. The 2016 is slated to arrive at the SAQ later this year. Pale yellow-beige-pink with pale yellow glints. Subtle nose of peach, apple, lemon and minerals with just a hint of telltale boxwood. In the mouth, it’s richly flavoured but fluid, faintly sweet on the attack but dry on the finish. Nippy acidity keeps things fresh and lively. A load of minerals provides depth and texture and last through the clean finish. Beautiful with grilled sea bream. 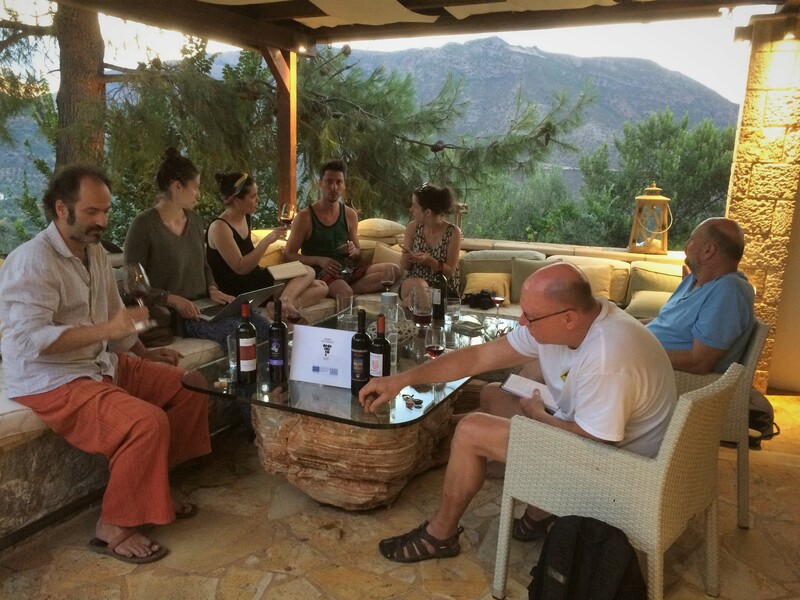 100% Mavro Kalavrytino from organically farmed bush vines. The manually harvested grapes are destemmed, crushed and given 15 days’ maceration. Made only with the free-run juice. Alcholic fermentation with indigenous yeasts in stainless steel. Unusually for a red wine, malolactic fermentation is prevented. Matured a few months in 5,000-liter wood vats. Filtered through coarse paper. 12.5% ABV. The 2017 can be found at the SAQ ($18.65, 11885457). Complex nose: fresh, herby, crushed cherries with faint floral and very faint leather overtones. Light- to medium-bodied and very dry. Fluid but winey, with lacy tannins and smooth acidity. The plummy fruit is darkened by slate and iron. Still a little tight on the long finish. Unique and delightful, one of my go-to Greek reds. Wine-making as above. Panagiotis says this is “the best vintage ever,” despite its being the vintage following the devastating fire. 13.8% ABV. 100% organically farmed Agiorgitiko. Destemmed. Macerated and fermented in stainless steel with indigenous yeasts for around two weeks. Underwent malolactic fermentation, a first for this cuvée (the cool vintage meant a high malolactic acidity content). Matured five months in 5,000-litre barrels. Filtered through coarse paper. Reducing sugar: 2.2 g/l. 14% ABV. A few bottles of the 2016 remain at the SAQ ($17.25, 12178957). Spice, licorice, coffee, black cherry and plum. Gains leather and herbed meat notes as it breathes. Medium-bodied, smooth and not at all alcoholic. The pure black cherry fruit – juicy but so not a bomb – has an umami side. The tannins are soft and velvety, the acidity bright. Long finish with a hint of black currant. Impressive. 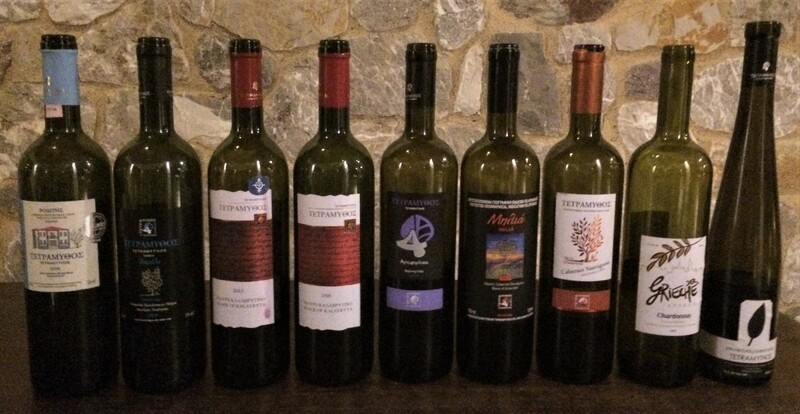 Merlot (66%), Cabernet Sauvignon (20%) and Mavro Kalavrytino (14%) from organically farmed vines. Manually harvested. Destemmed. Spent 12 months in second fill barrels. Unfiltered. Residual sugar: 2.4 g/l. 13.5% ABV. Cassis, plum, herbs, polished leather and hints of smoke and green pepper. Medium-bodied. The rich fruit is finely structured by wiry tannins and sleek acidity. Grounded in minerals and wood, topped with gingerbread spice and herb notes. Pure and delicious. Panagiotis suggests lamb with potatoes. 100% Cabernet Sauvignon from organically farmed vines planted before 2000 in two vineyards, one lower (“provides structure and alcohol”) and the other higher (“gives acidity and perfume”). Destemmed. Fermentation, in wood tanks, lasted five to six weeks. Matured 36 months in old barrels. Unfiltered and unfined. 14% ABV. We tasted the wine only a few days after it had been bottled. Textbook fresh nose of cassis and plum with hints of tobacco, cedar, herbs and slate. Green pepper appears after aeration. Medium- to full-bodied but not heavy, full of juicy fruit but fundamentally savoury. The acidity is fresh and bright, the fine tannins are still a little tight. Kirsch and tobacco linger on the long finish. Lovely. The winery claims this is ageable and I see no reason to doubt them. 100% Roditis from organically farmed vines. Matured in stainless steel and bottle. 12.5% ABV. Medium gold with pale gold glints. Faintly oxidized nose: yellow plum, dried herbs, limestone and hints of petrol. Beautiful, soft, glowing and layered. The fruit (yellow apple and pear) is still present and pure. The acidity is singing and there are minerals galore. The effect is sustained from entry through the long finish. If you have doubts about whether Roditis can age, this 11-year-old wine should put them to rest. As above but matured six months in second-fill barrels. 13% ABV. Rich gold with gold glints. Candied yellow apple, lots of minerals, background herbs, hints of caramel and pineapple. Lighter than expected. Savoury. Full of subtle flavours. A fluent current of acidity runs throughout. The fruit sweetens on the long, lightly bitey finish. “Will keep for five to eight years more,” Panagiotis says. A custom bottling for a Frankfurt restaurant. 100% Chardonnay from purchased grapes. Fermented and matured in stainless steel. Underwent full malolactic fermentation. 13.5% ABV. Lovely nose of mineral-dusted lemon and apple with hints of straw and herbs. Varietally correct. Smooth and clean. The touch of residual sugar is balanced by bright acidity. Decent finish. 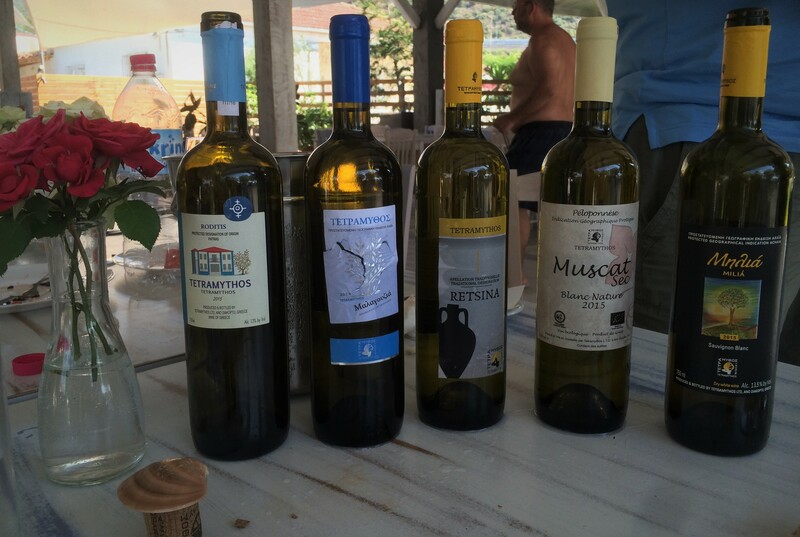 Easy-drinking and probably the most international of the Tetramythos wines we tasted. A kind of vin doux naturel. 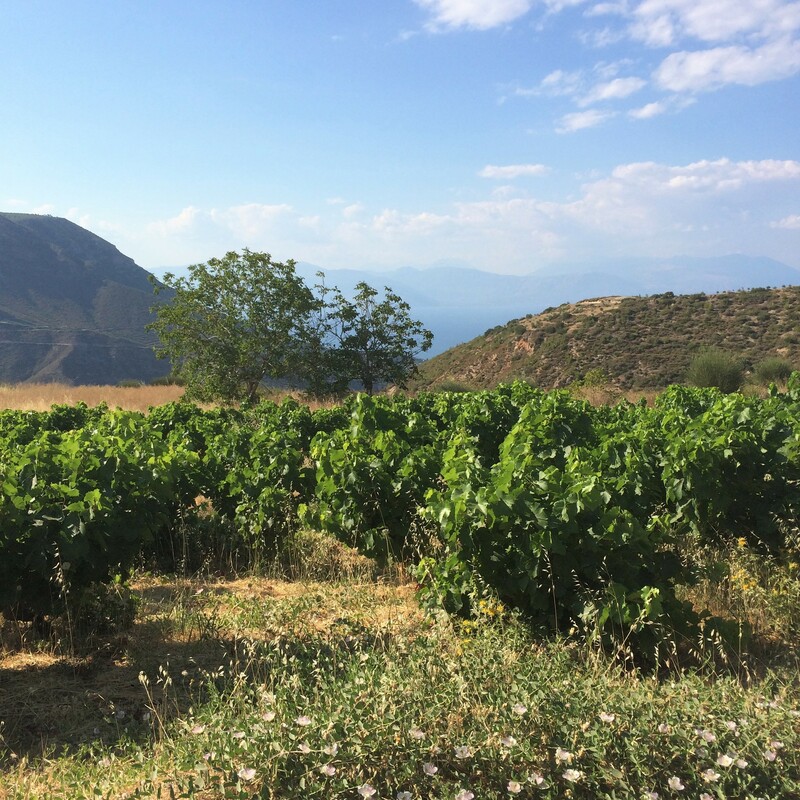 100% Mavrodaphne from high-altitude (1,500 m) vines. Picked the last day of harvest. Oversized dried Zante currants too big to market are added to the must. Fermentation and maturation in barrels last three years. Residual sugar: 58 g/l. 16.5% ABV. Engaging nose of plum, dried strawberry, sweet spice and garrigue. Not dry but not saccharine and surprisingly fleet. Faint tannic structure. Good acidity. This rich but not cloying wine could accompany savoury dishes like roasted duck.